The 500mb level the past few weeks has been unseasonably calm, which usually indicates that when it gets active it will make you pay for the quiet. 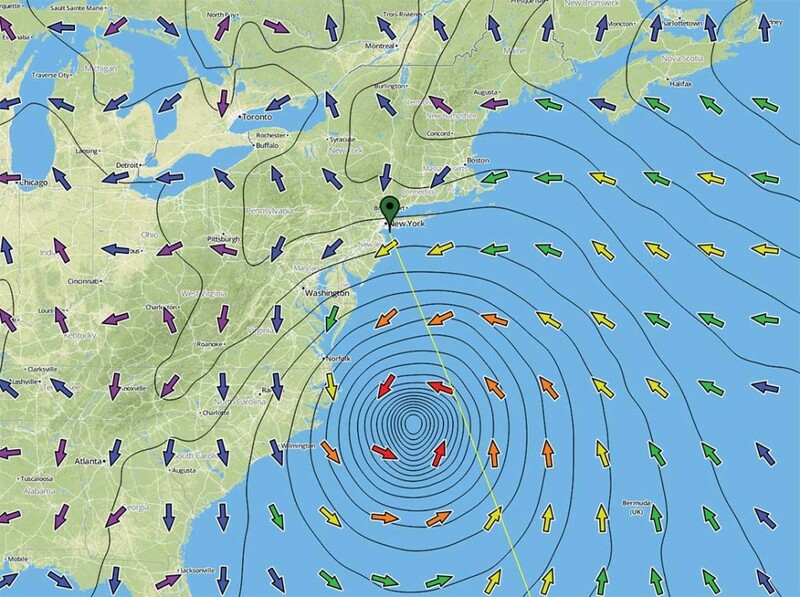 Tropical weather systems which transition to extra tropical storm structure can be far more dangerous than a compact tropical storm or hurricane, and feeding warm moisture into an upper level cold trough is one of the ways to make a weather bomb. The best hurricane holes on the entire eastern seaboard are in the Bras d’Or lakes that we just left. Three of the four of us on board are 75 or older, each with some form of physical impairment. We are wondering if we’re pushing things too hard in terms of weather risks and dealing with a real blow other than at anchor. The lovely weather we have experienced so far has dulled our sense of what is prudent in this part of the world in the equinoctial gale season! We need to be more careful with the choices we make with Cochise. The continuous comfort and ease of handling we usually experience–witness the 14,000 miles that have accumulated in what represents less than a year of cruising–mask the fact that, in some conditions, strength and agility we no longer possess may be required. 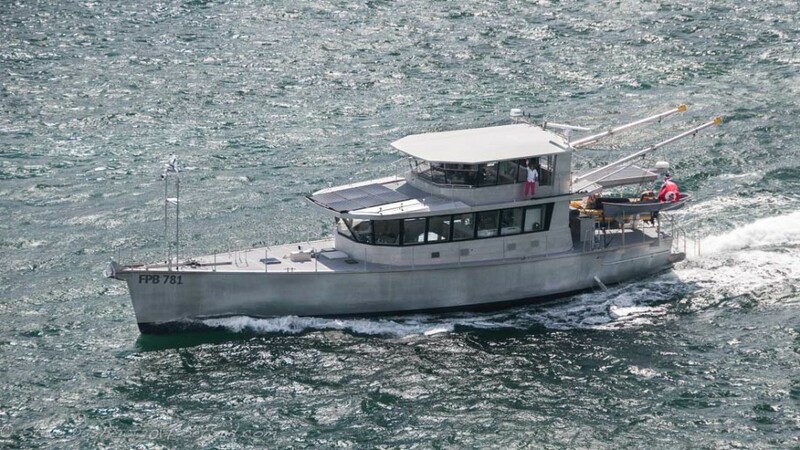 At a different age we would employ this new design’s abilities to extend our horizons, to explore wilder, even more out-of-the-way areas for an even longer cruising season. But that was then, this is now, and we need to content ourselves with the fact that, at an age when most folks are land bound, Cochise allows us to enjoy Cape Breton Island at the end of September, when we have these beautiful anchorages mostly to ourselves. It is only a hundred miles from here to southern Newfoundland. 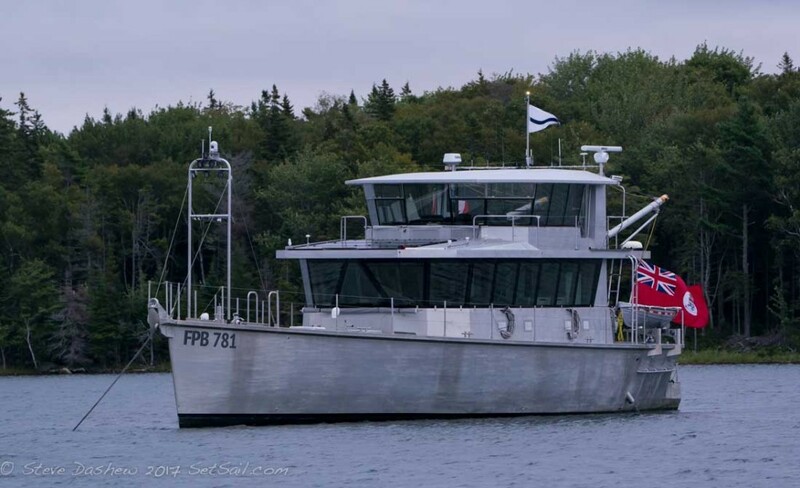 Eight to ten hours for Cochise to return to the security of the Bras d’Or lakes. But the entrance to The Bras d’Or pass had three knots of current in it yesterday morning, an hour before high slack. 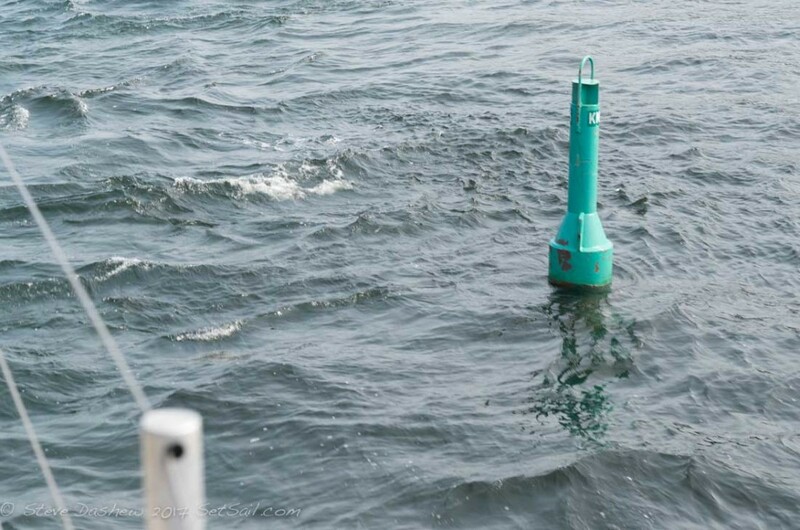 With almost calm sea conditions the current stacked sufficient waves to wash mud off the anchor. 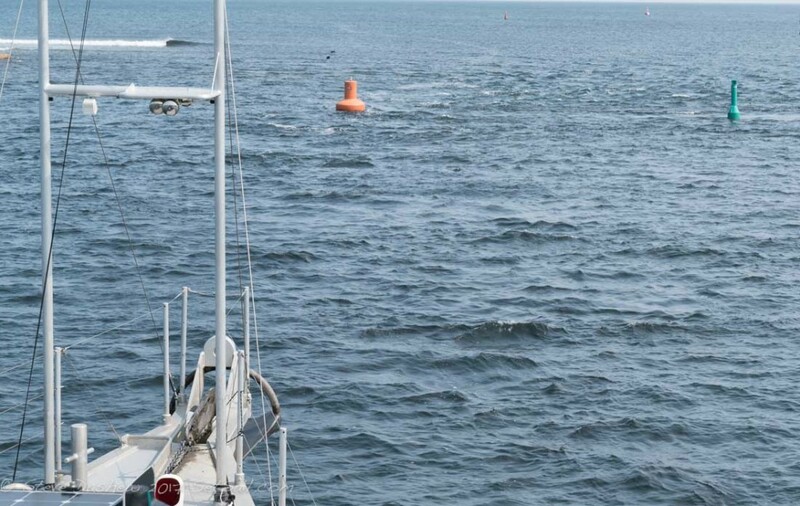 The entrance at Ingonish, between two buoys, might have left us with ten feet of room on each side. It was great fun. But challenging in relatively benign conditions. We would not want to run these in a larger sea, with poor visibility. We are maintaining a weather watch on four weather models via PredictWind.com (which we like a lot), as well as the updates from the National Hurricane Center and the Marine Prediction Center. With the latter, the 500mb 14 day loops are of particular value, allowing us to see the pattern in the previous weeks at the 500mb level. We have learned over the years to take predictions that forecast more than 72 hours ahead with a dose of skepticism. Even today weather models are often wrong, and tropical events are the hardest to predict. 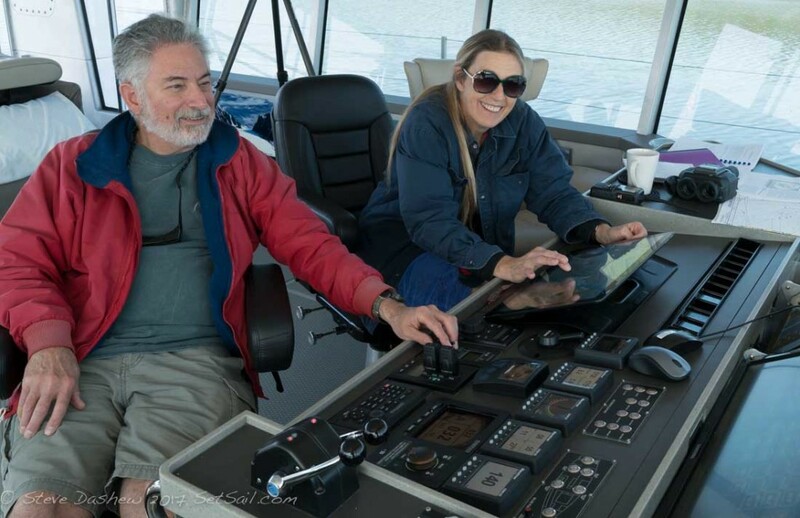 Our friends, Nancy and Michael Morrell, aboard with us now, have had the unfortunate experience of being caught in an unforecast 80-knot blow in the Gulf of Alaska, so they know the limits of weather modeling firsthand. Thursday morning, we’ve been studying the models’ most recent run. All show the tropical remnants missing us. But they also agree on rain and 20 to 30 knots of breeze. That combo makes returning to the safety of Bras d’Or problematical. There is no question on what we are going to do. We are going to sit here for a while and enjoy the the pleasant fall while it lasts rather than push ourselves. We have reached the turning point for this cruising season. When the time is right, in a few days or weeks, we will use Cochise’s long legs to take us quickly down the eastern seaboard of the US. 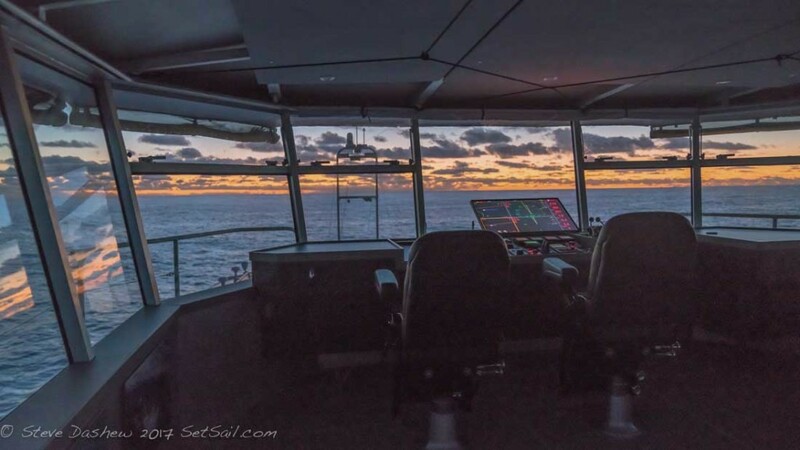 It will then be time to start dreaming about a warm beach, surrounded with turquoise water, with Cochise riding quietly at anchor as the tropical breeze ventilates her interior. Perhaps the Bahamas….. This entry was posted on Friday, September 15th, 2017 at 2:22 pm and is filed under Dashew Logs, FPB 78, The Logs. Both comments and pings are currently closed. HI Steve, Great to see you guys out and about after that much ‘knee-ded’ break. Your last ‘riding anchor’ comment got me to thinking. Have you had to test the holding power of the new pick compared to the previously much loved Rocna? Any noticeable difference in holding power in your opinion? Thanks, Anthony. We don’t have any scientific comparison between the Rocna and Manson. We chose the Manson because of a couple of design details we liked. The first is that the fluke has more of a point than the Rocna. We think this is a good feature. But without side-by-side testing there is really no way to know for sure. So far the Manson has held well. I work at the Lark Harbour Coast Guard lifeboat station on the west coast of Newfoundland.Beautiful spot with good weather and good anchorages.I live at an even better place called St. Lunaire Bay at the northern tip of the province.We have good weather,great anchorages and the tourists have all left for this year! I have followed your site,but would love to see your boat in person! We will be there net year, before the tourists arrive. Sounds like a smart decision. Glad you are staying safe. Greetings from the other side of the globe where the water is cold and the air warm! Nice to see you up and about after your accident. Bahamian tropical breezes sound pretty magical. The knee is getting better. This morning I did the first plank since the accident, and some push ups. Looking forward to trying out the rowing machine in the next week or so. Stop in Charleston on your way south for a Dark and Stormy! Thanks for sharing and stay safe! We will do that but probably not until next year as we will be hauling out in Beaufort, NC and then heading to the Bahamas some time next year.